For 2018, I hereby resolve to write more and eat less (cookies). 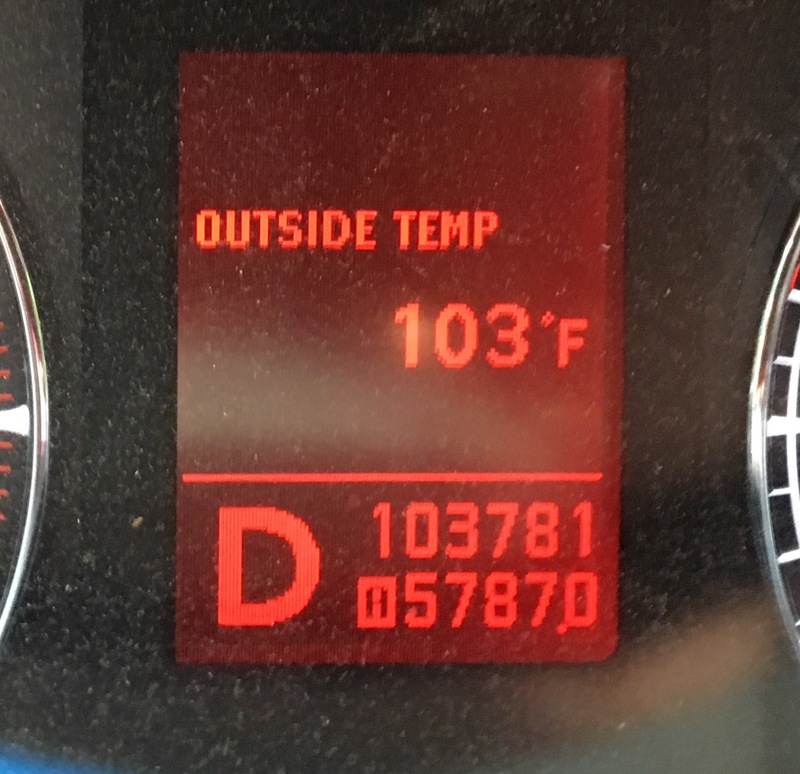 Last time I blogged, it was 100+ degrees outside, and I was writing about cucumbers. Today it’s 17 degrees, so it’s time to move into the realm of winter vegetables…and one of my new favorites is celery root. If ever there was a vegetable to embody the importance of not judging a book by its cover, celery root would surely be the poster child. Anne’s celery root salad (kereviz kökü salata) is a refreshing turn from my holiday stockpile of gingerbread and pizzelle. To brighten, I’ve substituted her orange carrots for purple ones, which remind me of the pink in the winter sunrise that warms my window during the cold months…and because my kid will sooner eat a food that is pink than any other color. Turks use cacIk (pronounced JUH-juk) as a refreshing soup-able side or with additional water and ice and mint as a yogurt drink. I’ve used it also as a salad dressing. 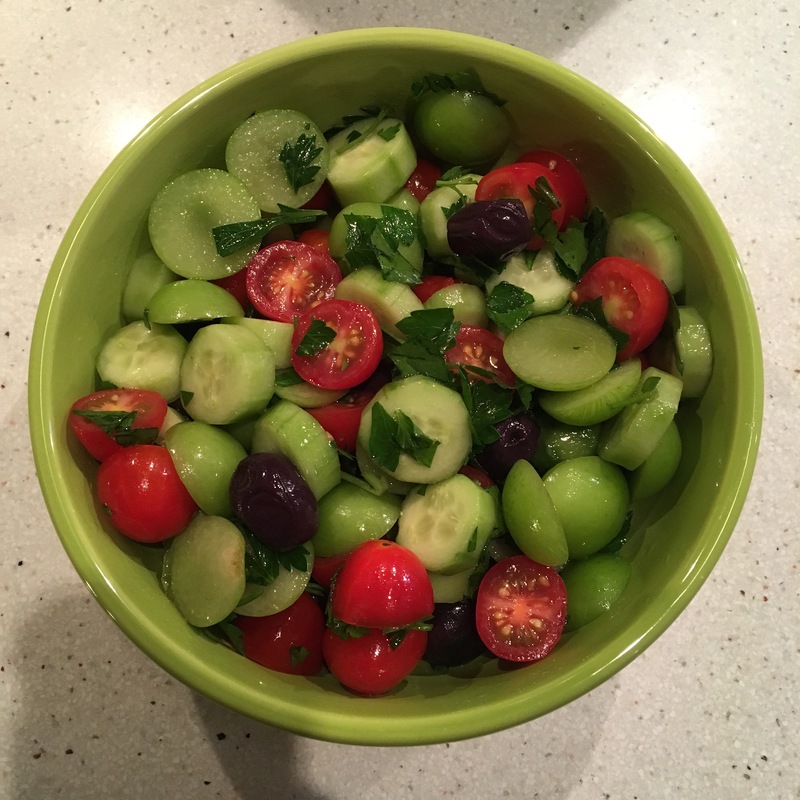 And thanks to my Uncle Joe, I had the sweetest garden-fresh cucumbers for this recipe! For thinner cacIk (drink, soup, salad dressing), use a non-strained yogurt. For thicker, use a strained yogurt. The erik (a small, green, tart Turkish plum) are in bloom again…it’s that time of year. But this year their arrival is bittersweet. I feel like Katharine Hepburn’s character in Stage Door. “Now I place them here in memory of some[one] who has died…I’ve learned something about love that I never knew before…help should come to people when they need it…” And, thanks to my father-in-law, Oktay Ergunay, who for years until his retirement served as the Turkish government Director of Disaster Affairs and also the General Director of Turkish Red Crescent, help came to countless who suffered under the rubble and rebuild of earthquakes, who were left homeless from floods and landslides and every sort of natural disaster in Turkey, and who suffered neighboring regimes and migrated to Turkey with nothing but the clothes on their backs, children in their arms, and the hope of a better life. Baba devoted his life to loving and serving people through his scholarly earthquake engineering research and teaching, his smart and strategic disaster management, and his huge heart – steadfast in his insistence that every life is worth living, every life is worth saving. And my father-in-law had a thing for green fruit – kiwi, green apples, and these tart little green plums. This spring, quite unexpectedly, he left this world, much to the devastation of my husband, my mother-in-law, my brother-in-law, our uncle, aunt, cousin, and all the family, friends, and colleagues who dearly loved him. And he left me with an entire climate-controlled refrigerator fruit drawer of erik that had been awaiting his summertime arrival. It’s marvelous and inspiring when lyricists and children’s writers aren’t afraid of using more challenging vocabulary, like the word fractal. 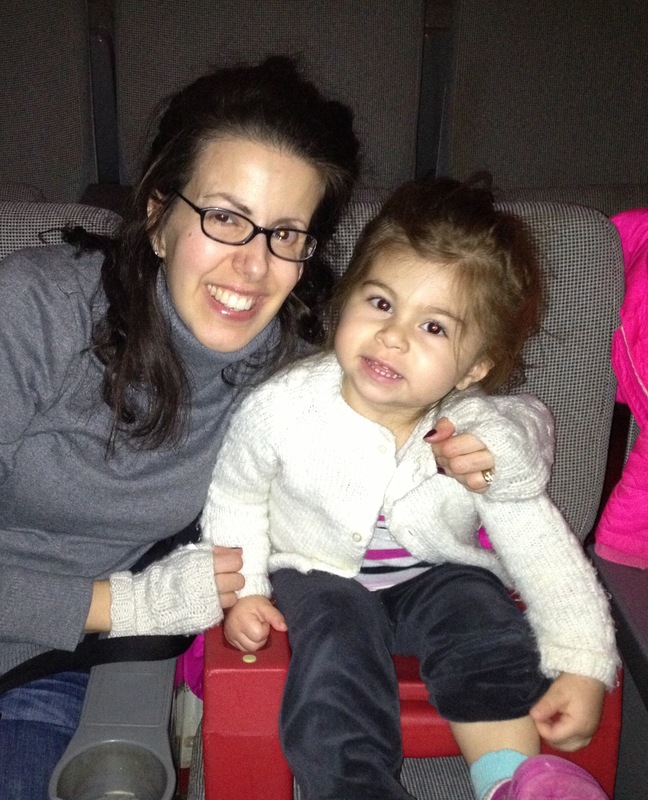 Kids are sponges – they can get it, we just have to give them a chance. And thanks to the writing team, Robert Lopez and Kristen Anderson-Lopez, my kid had a new and unlikely word in her vocabulary…and she wasn’t afraid to wield it. So here’s an unlikely segue – cauliflower is a fractal, an object with the incredible attribute of having its large-scale pattern continuously recur at progressively smaller scales. 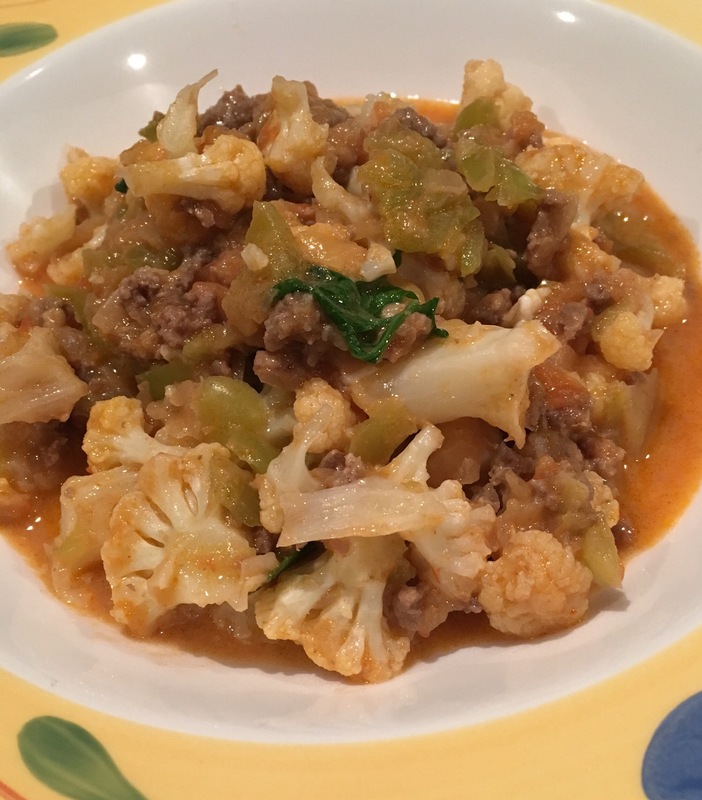 Now there’s something to chew on – and so I bring you Anne’s cauliflower stew, karnΙbahar musakka. 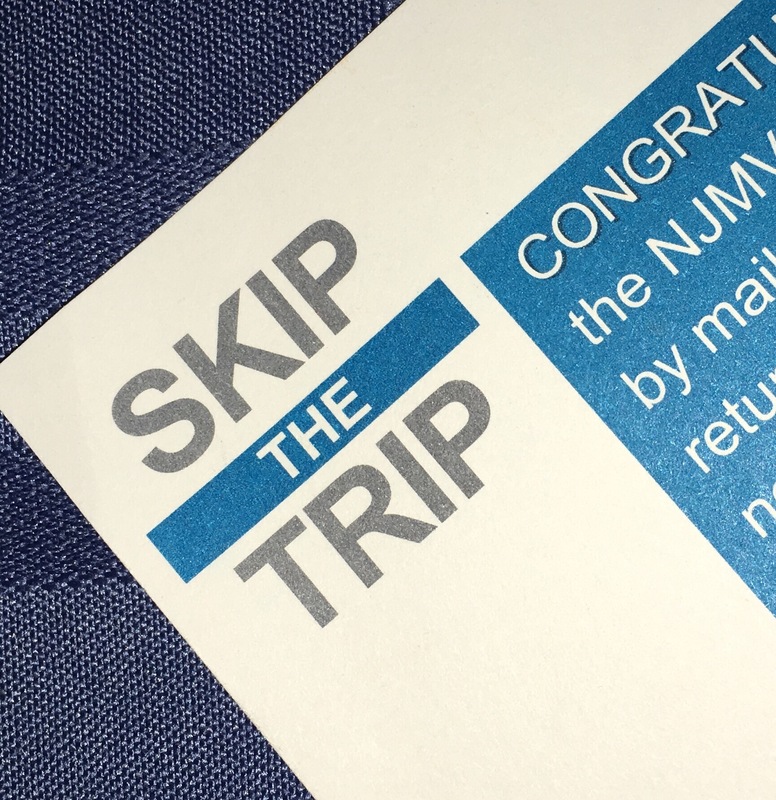 So after a frazzled day of work, a kid practicing independent decision-making on just about everything from dinner to bath to bed, a shocking shortage of wine in the house, and then (yet another) rejection from an editor for one of my manuscripts, the unthinkable presented itself in my mailbox: a love letter from the Motor Vehicles Commission. Skip the Trip, it said! Renew your driver’s license by mail! No day-long trip to Zootopia’s Flash, no clearing work schedules or arranging extra child care. The Garden State MVC dropped a touch of unexpected sweetness into my day, which made me think of iç pilav – a rice pilaf with a hint of sweetness from currants, pine nuts, tomato paste, and cinnamon. garnish with parsley and enjoy! 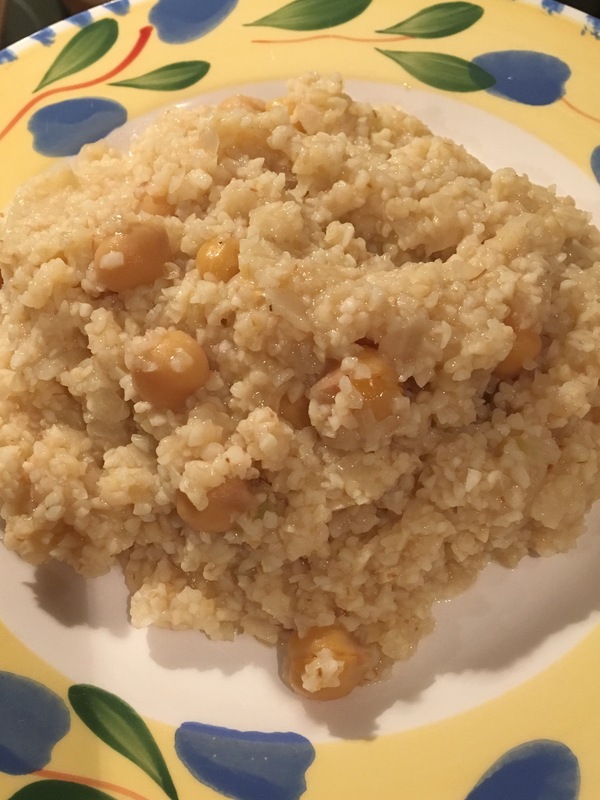 Gold, frankincense, and myrrh…not too shabby, but, just for a minute, consider what marvelous food could’ve been made for all the visitors if the three wise men brought onions, chick peas, and bulgur? Buona Epifania! High in potassium, protein, and dietary fiber, you simply can’t go wrong with bulgur pilaf – nohutlu bulgur pilavi – for dinner tonight. I’ve yet to see anyone who doesn’t enjoy this dish, and it pairs well with meats, fish, tofu, or is fabulous on its own. Hold on to your knickers, I’ve got a special guest blogger to help you ring in the New Year with his family recipe egg nog! Twenty years ago, David Keown was a part of my work family. And nothing felt more like family – in that basement-level dwelling with the soft whirring of CPUs, the snow-white glow of fluorescent lighting, and the intense collegiality of friends who had your back at every server outage and script run amok – than Columbia Business School’s IT department with David at the helm. Every year during the holidays, David lovingly entrusted his grandmother’s culinary legacy to us – a legendary egg nog – and combined it with a holiday open house to spread good cheer within the school (and in so doing reassured our community, again and again, that computer geeks can froth with the best of them….). I don’t remember the first time my parents made this recipe, or where it came from, but it’s always been “the family eggnog recipe.” I have many “growing up” memories of sneaking back to the Santa eggnog bowl at our family holiday parties to have another cup because it was like a thick milkshake…with alcohol! When I went away to graduate school, I claimed the tradition as my own, and introduced the experience to my community of friends. Years later at Columbia, we hit upon the idea having an open house right before the holiday break, when all the students had gone, as a way of connecting with our constituents. Everyone in the group contributed to a potluck, and I mixed up a super-sized batch of eggnog. The event was a hit, and we made it an annual party. The key to the recipe is whipping the egg whites and the cream. It transforms the nog from the thin stuff you get in the grocery store to an irresistible treat that gives you a white mustache with every sip. And that keeps people coming back years later asking for the recipe. The following original method does not cook the eggs. If you’re nervous about raw eggs, you can follow the alternative directions for Phase 1 where everything is cooked. Beat yolks, gradually adding 2/3 of the sugar. Add the milk to the egg yolk mixture, whipping all the while. Combine milk and 1/2c sugar in medium saucepan and bring to a boil over high heat. Remove from heat and let mixture steep for at least 20 minutes. Return the mixture to the stove over low heat. Prepare an ice bath in a large bowl. Whisk the egg yolks in a medium bowl until pale yellow. Slowly whisk the warm milk into the yolks, then return the mixture to the saucepan. Stir in 1c of boubon then remove from heat. Transfer the mixture to a medium bowl and nestle it in the ice bath. Whisk until the mixture is chilled, about 5 minutes, then stir in the remaining alcohol. Can be kept in the refrigerator for a day. Now let’s use the lemon-egg sauce you’ve just mastered in something called sehriye corbasI – a vermicelli soup with lots of opportunity for creativity! Anne (=Turkish word for mom) taught this recipe to me with a beef base, but you can also use chicken and chicken broth, carrots, celery, etc. – the sky’s the limit! The other day I cut into a lemon to make the lemon-egg sauce used in many Turkish recipes. And this was the cross section – a throw-back to my left ovary in its artificially hyper-stimulated heyday. Follicles are not exactly round and perfect, as one would otherwise think. They’re smooshed together like a bunch of sleeping hamsters, with forms malleable enough to manage the crowded quarters prior to egg retrieval. During an IVF cycle, daily – sometimes twice daily – follicle-stimulating hormone injections will hopefully yield a dozen 15-20mm follicles in each ovary. This lemon made me laugh (inasmuch as citrus fruit can do such a thing). I’ve been having another writing dry spell. Let’s just call this lemon what it is – a nudge that reminds me to get cracking. I abandoned my blog for summer fun, stacked my #amwriting #kidlit projects with the rest of my unopened mail, and my cooking has been Surf Taco on speed dial. So for all those, like me, who have been lying at anchor, start slicing open your lemons, remind yourself of the follicles of potential waiting to be extracted, and go make a mess in your kitchen…perhaps by simply starting with the sauce. Once upon a time…before baby, when “date nights” were plentiful and leisurely meals were savored without a second thought as to what we’d owe the sitter if we linger another 15 minutes, we regularly frequented our neighborhood Turkuaz on the Upper West Side. With its warmly-lit, tented ceilings and its vast array of hot and cold small plates (and a spouse who could order in Turkish, which worked rather well for me…think Jamie Lee Curtis’s character in A Fish Called Wanda…), Turkuaz always delivered a delicious escape from the bustling city. When Turkuaz first opened, at the start of the meal, they served a dip of carrots with yogurt – yogurtlu havuc salatasi – with warm pide bread. Loved it so much I had to run home and duplicate. And today I’m duplicating with rainbow carrots to create 3 different colored carrot dips.